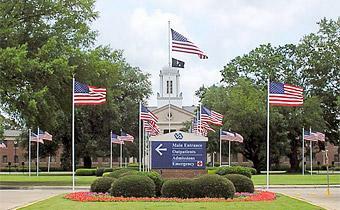 The Carl Vinson VA Medical Center is located on a beautifully landscaped 75-acre tract in Dublin, Georgia. The 340 operating-bed facility provides both acute and extended care services and has approximately 800+ employees providing comprehensive health care to veterans in Middle and South Georgia. Services provided at the medical center include primary care, mental health, ambulatory and primary care, optometry, women’s health, and extended care, as well as specialized programs to include cardiology, pulmonary, general surgery, podiatry, urology, and physical therapy. Mental Health services available include treatment for substance abuse, post-traumatic stress disorder, and general psychiatric care. In addition to the services available at our medical center, Primary Care services are provided at three community based outpatient clinics (CBOCs) - located in Albany, Macon, and Perry, Georgia. The Carl Vinson VAMC has established partnerships with schools of higher education and is categorized at Education Level 3. The primary affiliate is with Midwestern University, College of Health Services, with which VA has developed a unique and very close professional relationship. CVVAMC has a range of clinical disciplines and continues to receive requests for new affiliations. We have active affiliate agreements with 24 college and university programs in many fields, including; Surgical Technology, Ambulatory Care Clerkship, Pharmacy & Health Professions, Registered Nurse & Medical Technician, Physician Assistants, Professional Programs in Nursing & Nurse Practitioners, Recreation & Sports Management, Psychology, Health & Kinesiology, Leadship Technology & Human Development, Bio-Medical, Personal Care Assisting & Respiratory Therapy, Nurse Practitioner Masters Level, Marriage & Family Therapy, Psychiatry, Internal Medicine, Geriatrics, Nursing - BSN & MS, Associate Degree in Nursing, Doctor of Pharmacy, Dental Assisting, Allied Health and Rehabilitation Counseling. On an average, we sponsor around 4 physician assistant students per quarter, 2 surgical technicians per quarter, 2 pharmacy technicians every 5 weeks and around 15 nursing students every 3 to 4 months.